INISHOWEN'S senior citizens were treated to a special day out in Buncrana on Friday when the kind-hearted students of Scoil Mhuire hosted their annual Christmas Party. 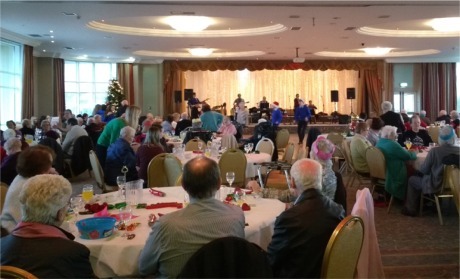 The 'Back in the Day' bash was held at the Inishowen Gateway Hotel where the local pensioners enjoyed a delicious dinner with all the trimmings, a chat with old friends and a packed line-up of entertainment. The event is hosted and organised each year by Scoil Mhuire students and their teacher Annette McGonagle. Inishowen senior citizens enjoy their annual Christmas Party at the Inishowen Gateway hosted by Scoil Mhuire students. Senior citizens arrived to the bash from all over the peninsula including Buncrana Community Hospital and Day Care Centre; The Beach Hill Nursing Home at Lisfannon and Nazareth House, Fahan. OAP guests from Carndonagh and Clonmany were also warmly welcomed to the event as was the former Bishop of Derry, Seamus Hegarty. The guests were assisted to their tables and given tea or coffee by nursing care staff and the young students - bedecked respectively in the requisite Santa hats and festive Christmas jumpers. The special OAP guests were then given a tasty turkey and ham or beef dinner followed by their choice of trifle or apple tart. They were also treated to after-dinner sweets, a raffle and singing and dancing displays by the talented young students. There was also a special video message from country star Daniel O'Donnell. MC for the day was local councillor Nicholas Crossan. The great day out which ran from 11am - 4pm, was set against the beautiful backdrop of a serene winter sunset over Lough Swilly, as seen through the hotel's large function room windows. Well done to everyone involved.